Introduction to Soil: Soil is an material which is formed by the disintegration of the rocks. Generally it is in unconsolidated form on the earth. It can also be defined as the top most layer of the earth crust, on which the vagetation grows. It also include the deposits below the water on the ocean bed, so it forms the surface of the earth, above the water level and also below the water level in sea and oceans. Word Soil is derived from the Latin word "solium" which means upper layer of soil. The type and characteristics of the soil largly depends upon its process of formation. The shape of the particles is changed/altered by the transportation process. Thus all the engineering properties like the consolidation, shear strength, permeability etc. 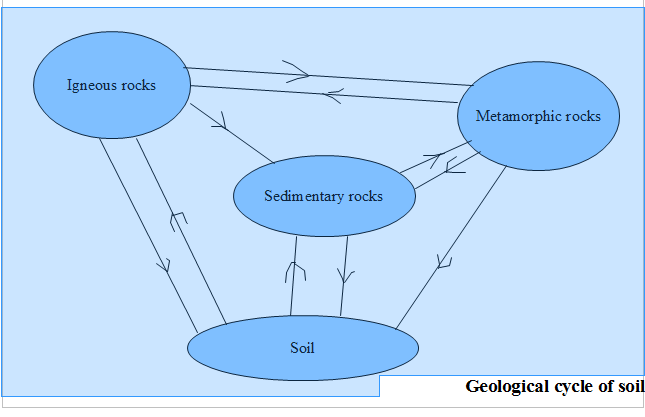 of a particular soil, largly depend upon its mode of formation, stress history, groundwater conditions and physiochemical characteristics of the parent material, from which the soil particles are formed. The soil particles are assembled in such a way that there are some voids left in between the particles, these voids are either filled with water or air. So for a soil, its behavior depends upon three components, i.e solid particles, liquid and gas. So now we can visualize the soil deposit as a particulate system, comprising three phases, i.e. Solid phase, liquid phase and gaseous phase. Formation of soil: The soil is formed by the weathering of the rocks by various weathering agencies, like air, water, glaciers and various chemicals which react with the rock minerals to disintegrate them. The rocks are disintegrated into the smaller particles by these agencies and it may be transported to a different place again by these agencies or it may remain at its original place of formation. According to the size of the particles of the soil it is classified into sand, silt and clay. The heavier particles are not easy to transport so they get deposited in the near places to their formation, and smaller particles like clay are deposited at the farther places like in planes. The soil which remains at their place of formation, are known as the residual soils, and the soil which are transported to farther places and get deposited their are known as the transported soils. Black cotton soil is a kind of residual soil, which is formed after the disintegration of the basalt. The earth crust contain the magma and cooling of which results in the formation of the igneous rocks, these rocks disintegrate into soil, and soil again converts into rocks. It is known as the geological cycle. The igneous rocks are formed by the cooling of the molten mineral present in the earth crust known as the magma. It can cool down below the earth surface after it gets the lower temperature or it may cool after it comes on the surface of the earth. The non-crystalline rocks like the basalt are formed on the surface of the earth but the crystalline rocks like granite are formed below the surface of the earth under the action of the lower temperature. These rocks when attacked by the various weathering agencies may result into the formation of the soil. The soil may get deposited in the earth bed and may form the sedimentary rocks, when the enough environmental conditions are available. Igneous rocks may also go into the process of metamorphism and may result in the formation of the metamorphic rocks. The metamorphic rocks on the other hand may again get sink into the earth crust to form magma, or it can get disintegrated to form the soil, which again may get converted to sedimentary rocks. The soil formed from the different rocks will have similar chemical composition as of the parent rock, but the physical and chemical properties are changed. The soil formed after the disintegration of the quartz will result in the formation of the sand and silica. Sand and silica have different properties due to variation in their shape and size. Clay on the other hand is more finer than these two, so it possess different engineering properties. Soil Mechanics: Soil mechanics is a new branch of the Civil Engineering. Dr. Karl Tarzaghi is knwon as the father of the Soil Mechanics. He was born on 2nd October 1883 in the Prague, and died in October 25, 1963 in Winchester, Massachusetts. He wrote a book in german language "Erdbaumechanic" means soil mechanics. Soil mechanics is the application of the laws of the mechanics and hydraulics to engineering problems dealing with sediments and other unconsolidated accumulations of solid particles produced by the mechanical and chemical disintegration of rocks regardless of whether or not they contain an admixture or organic constituents.